These women have bridged the industrial gender gap and are inspiring the next generation of women to follow their lead. Women accounted for 29% of the U.S. manufacturing workforce in 2016, the U.S. Census Bureau reported in October, despite making up 47.5% of the overall U.S. working population. Increasing women's representation in the manufacturing industry could help manufacturers address a projected labor shortage of two million workers by 2025. 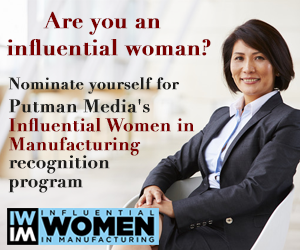 "Women constitute one of U.S. manufacturing’s largest pools of untapped talent," an April 2017 study from the Manufacturing Institute, APICS, and Deloitte observed. At Plant Services, we're committed to highlighting the voices of women who are effecting change and bringing fresh perspectives to the manufacturing and industrial production fields. Here, five insights from women representing an array of manufacturing sectors who were featured in Plant Services in 2017. "Knowledge capture tools built into a field service software system will allow technicians to view tutorials or videos, either in a field or in a depot repair environment, to guide them through key processes or to solve challenging issues. This can increase first time fix rates and reduce time-on-site, which reduces cost of service provision while also ensuring customer satisfaction and SLA compliance. It can also be a force multiplier, taking the knowledge of your most skilled employees and extending it across more workers or even retaining knowledge of retired or departed workers." "As a Millennial, we’re used to [real-time data access ]. We are used to having answers right away and I’m shocked that places don’t have that. Some are still writing down inventory on paper. It’s actually amazing to me." "A lot of people seem to have this idea that if you have a quote-unquote collaborative robot, then you are inherently safe; you don’t need fences or other safeguards ... The robot itself doesn’t operate in a vacuum. It may be the case that it’s necessary to continue to have fencing around some of that robot, (and) leave a hole where the actual collaboration happens ... It’s your responsibility to send people home at the end of the day in the same condition as they were when they arrived." "Well-developed prescriptive analytics solutions will draw from business intelligence (BI), operational intelligence (OI), enterprise asset management (EAM), enterprise resource planning (ERP), material requirements planning (MRP), and other business information systems and prognostic tools. Countless data points can be factored into the algorithms, such as asset criticality, work priority, fault data, ambient temperatures, and the average lifespan of a given part. Using this data, the solution will model “what if” scenarios of possible options and outcomes down to the work execution level. Each option is systematically evaluated in order to identify the optimal course of action, and that recommendation is then pushed to the EAM and appropriate personnel for action."